The government is apparently worried about parking problems being faced by practically all localities in Malta and Gozo. In fact, during a press conference by Transport Minister Joe Mizzi in Rabat recently, it was stated that a policy document on parking has been submitted for Cabinet’s consideration, prior to its being issued for public consultation. As usual, the government worries about effects and is very rarely willing (or able) to exercise some thought on the causes of the everyday problems we all face. The National Statistics Office says that at the end of the Third Quarter of 2014, Malta had 332,455 vehicles on its roads. With a population of around 421,000 this translates into 790 vehicles per 1000 population, one of the highest vehicle ownership profiles in the world. Being one of the smallest countries, with everywhere being within easy reach, it would be logical to expect that Malta should have a much different and lower vehicle ownership profile. This also sharply contrasts with the vehicle ownership profile of the USA (786), Italy (682), UK (516), Spain (592) and Switzerland (573). Even Luxembourg’s profile which stands at 741 per thousand is lower than Malta’s. To visualise the severity of the problem, it is being stated that if Malta were to have a vehicle ownership profile of say 500 vehicles per thousand population (close to that of the United Kingdom which currently stands at 516), the total number of vehicles on Maltese roads would be 210,673, that is a reduction of 121,784 vehicles from the current total. This would amount to a reduction of 36.63% of vehicles on Malta’s roads at present. This I submit is a realistic objective that we should aim for: reducing 122,000 vehicles from Malta’s roads. Thus the issue which should be tackled by Malta’s Minister for Transport is not one of seeking space for parking but reducing the number of vehicles on our roads. 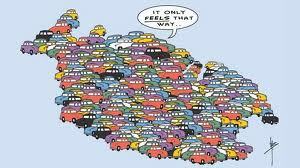 While parking is a problem, which will undoubtedly get worse, it is not the major transport problem in Malta. Extensive car ownership is “the” problem. Too many vehicles on the road is not a sign of affluence but a clear indicator of administrative incompetence throughout the years. This should be the primary target of transport policy: facilitating sustainable mobility for all while reducing radically the number of vehicles on the road, thereby reversing the accumulated impacts of administrative incompetence. Unfortunately, the government’s objective so far seems to be the precise opposite: making way for more vehicles on the road. This is the only real significance the parking policy-in-waiting or of major transport infrastructure projects in the pipeline which absorb millions of euros. These funds could easily be used to promote more fruitful objectives. It should focus on facilitating sustainable mobility for all while reducing vehicle ownership as a policy target would address traffic congestion, parking and air and noise pollution. An added benefit would be that it would also cost much less to both the state and to the individual. In the long term, as a result of reduced air pollution, we will also have less respiratory illness, consequently reducing both the individual as well as the national health bill. Fewer cars on the road would also encourage more bicycle use and maybe the introduction of more and continuous bicycle lanes in contrast to the intermittent ones currently provided by Transport Malta. This cannot be done overnight. Having been neglected for the past 50 years or so, it will take quite some time to reverse the dependence on private vehicles nurtured by a public transport system which was allowed to disintegrate. Various policy initiatives can be taken. Both the carrot and the stick have a role in such policy initiatives. A number of interim measures may need to be introduced until such time as the new public transport provider, Autobuses de Leon, establishes itself firmly. When this is done, it is in everybody’s interest that public transport use is the success it never was to date. A public transport system has to be both efficient and reliable. To achieve these objectives substantial subsidies are essential. This is the primary reason why the Arriva experiment failed. It was starved of subsidies as a matter of policy and was expected to survive on a relative pittance. Even on the drawing board, it was clear from day one that the Arriva experiment was doomed to fail. Public transport is not made up just of the public buses. The monorail initiative currently on the drawing board as well as adequate sea-transport [servicing primarily Valletta, Sliema and the Three Cities] will also go a long way to reduce th number of vehicles from our roads. These are the policies which the government should consider implementing. Will it be bothered?